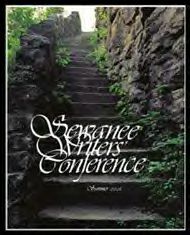 I got a bit of very good news last week when the Sewanee Writers’ Conference offered me a fellowship. I love Sewanee. I’ve been to a lot of conferences and it is my favorite (with Bread Loaf a close second). Not only is the faculty first rate and the other writers generally very talented (admission to the conference is extremely competitive), but also the staff are the nicest people in the world. Really. I first went to Sewanee in 2004, the year after I received my MFA. It was my first big conference (I’d been to Under the Volcano in Mexico that January) and I didn’t know what to expect. I requested and was assigned to Richard Bausch’s workshop, which he team taught with Jill McCorkle. It was fantastic. Bausch gave me advice on a novel that still hasn’t quite recovered, but I think it was sound advice. Terrific experience. I started publishing short stories and so when I applied again, in 2006, I received a scholarship. That year I got into John Casey’s workshop, co-taught with Claire Messud. Again, fantastic. The conference almost never awards two scholarships in the same genre to the same person, so in 2008 when I wanted to go again I applied and went as a participant. That year I had a mind-blowing experience working with Tim O’Brien, who was extraordinarily helpful. If I hadn’t already been a Sewanee fan, that would have made the sale for sure. Finally, this year, because my book came out in 2009, I was eligible to apply for a fellowship for the 2010 conference. (I only seem to apply in even years, but the conference really does happen every summer.) So I applied and held by breath because I wanted it so much. And I got it. Much cheering in my house when I got the word. And the conference yesterday posted online the bios of the fellows and scholars. I’m truly honored to be included in this bunch, and I can’t wait for the conference to begin on July 13. >Been reading your blog regularly since the beginning of last year but never commented. Too lazy. Then again, most times I agree with you. Just curious: I always thought the fiction issue included four stories. This year's issue has double that! I've only been a subscriber since '07, is 8 stories in the Fiction issue something rare? >Congratulations – very, very well deserved. Usually 3 or 4, yes. So 8 is a lot. I hope they're worth the trouble. >Congratulations, Cliff. You deserve the honor! I've been reading your blog for several months now, it will be nice to meet you. I'm going as a participant and still keep waiting for them to send me the email saying that they made a mistake. >@Kat — Thanks! Have fun at that OTHER conference! @Jim — Thanks, and please find me to say hello in Sewanee! It's going to be fun.